If you were asked to pick one word that would encourage your team to be as successful as possible this year, what word would you choose? If you are the head of a sales team, perhaps your word would be effort or grit or service. If the team you are leading is in health care maybe it's healing or extraordinary or presence. And if the team you're leading is a crew of little ones at home, maybe your word is patience or listening-ears or now! But what if your team was a disparate group of 18 to 22-year-old athletes? What if they came from a couple dozen states, with differing beliefs and values, and from every imaginable upbringing? What single word might bring them together and forge them into champions? The winning head coach of the 2018 College Football National Championship considered this question as the season began, and his answer might surprise you. Let me explain. Coach Dabo Swinney is a successful guy by every measurement these days. He is incredibly successful financially, is one of the winningest coaches over the past decade, just won his second National Championship, and has several times received College Football Coach of the Year awards. He's got a lovely wife, three healthy kids, and a good life. He's got it all. Growing up in a broken home was difficult for Dabo, and he was sometimes forced to sleep in the family car to avoid the unwarranted wrath of his abusive father. Although he was an extraordinary athlete, Dabo didn't receive a single scholarship to play football in college, and instead had to make the team as a walk on. After three years of intense practices, studying and preparing, he finished his playing career with a total of 81 yards. When he couldn’t get a job in college football after graduation, he took a job in commercial real estate, but struggled. And after eventually making it back into football, his first season as head coach of Clemson ended with a lopsided loss that almost resulted in him being fired. 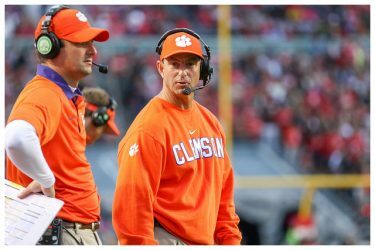 One of the key drivers for Coach Dabo Swinney has always been a steadfast belief in work ethic, a deep conviction in his faith, and the certainty that the best is yet to come. What One Word Defined Clemson's 2018 Season? So, what was the word Coach Dabo Swinney used to unify his team, galvanize their will, and ensure their success? What was the word that would take a group of 105 unique young men and transform them into a team that goes 15-0 and steamrolled their competition? Was it fight or outwork or destroy? No. The word was seemingly more gentile, but undoubtedly more transformative. The word was joy. Joy often gets confused with happy. But while happy is a fleeting, shifting emotion, joy is a state of mind. It is not easy, and it is not common. But it is a choice and it changes lives. Starting with one - and then a team - choosing it. Joy unified a bunch of college boys to play, work, smile, fight, learn, and win together. And my friends, I am absolutely confident that the decision to pursue that joy will elevate your game, too. Because what I know is this: things may go wrong for you today. You’ll get knocked down. You'll be let down. You'll deal with adversity and naysayers and calls that go against you. But in choosing joy, you'll pop back up and be fueled with both the immense power in the present and the unbridled hope for the future. You'll be on fire for life and totally unstoppable. Just ask the Clemson Tigers. Today is your day. Live Inspired. I thought of this story not only while witnessing Coach Dabo Swinney's massive smile after winning the College Football National Championship last week, but also while visiting with another friend of mine from South Carolina, Steve Grant. Steve has one of the most tragic and redemptive stories I've ever heard. On our Live Inspired Podcast, he shares his own family's struggle with addictions, mistakes, tragedies, and lessons, and ultimately what it means for all of us. With more than 72,000 Americans dying of a drug overdose last year alone, this is a topic we need to discuss, and I believe Steve's story could be life-saving for you or a loved one. Listen in and join the conversation here. The post What’s Your Word? appeared first on John O'Leary.